Fred reports "We have had a very wonderful baptism in our church, Hope Missionary Baptist Church in Jinja, Uganda. This is the first function in our church. Many people in the community now understand what we are doing for the Lord in Jesus name. 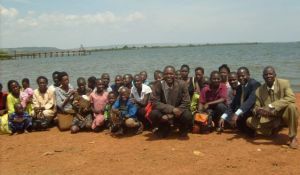 Two people got saved when we went to the baptism site, Masese Lake Victoria. We baptised 36 adults." Keep up the good work. You are representing Christ. God bless you. Praise God for this wonderful harvest in Uganda! Precious souls added to the kingdom. Thank God for the work of the Lord in Uganda Africa.